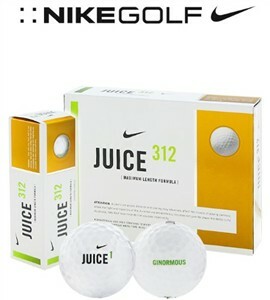 These Nike balls are really juiced up and go a long way. This is a hard 2-piece distance ball with a cheap Suryn cover. The ball has Nike's 312 dimple design, which gives the ball a high trajectory, and the cover has "hundreds of sculpted recessions that control directional agitation." By "agitation," they mean wind -- not trees! Remember the old Mojo balls? This Juice ball, I believe, is the updated Mojo ball. This ball is a good ball to play in the wintertime. It has a fairly soft compression (70) and powers through the wind. And the ball flies very high. You don't really need a three-piece spinning ball in the winter when the greens will hold any high shot that is fired in regardless of the spin. Plus, the balls are very inexpensive and very durable. For a similar ball with a soft compression, check out the Power Distance Golf Balls.